Beautiful boat with many custom upgrades. Included marina slip and 400 gallons of diesel fuel. Only 100 hours on this boat. Sleeps 6. 3125 Twin Catepillar engines. Settee on port with L-shaped settee on starboard which converts to a double bed.Marine toilet and shower with sump.Galley is equipped with microwave,stainless steel sink,Norcold refrigeration,electric 3 burner stove,granite counter tops,teak and holly sole with removable carpet,television,macerator pump,cd player with 4 speakers. Hydraulically controlled lifts for engine access in cockpit. Glenndinning engine synchronizers,12 volt oil change system,fuel polishing system,racor fuel filters, Groco seacocks,freshwater washdown,saltwater washdown. 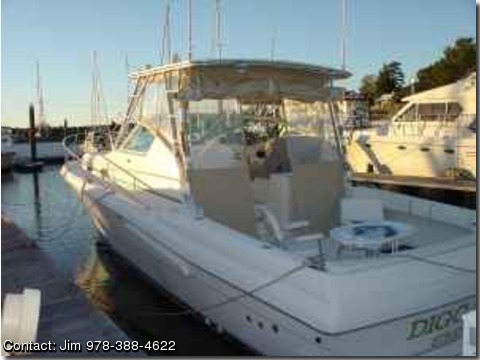 Electronics include Raymarine 220 VHF,backup VHF,Raymarine ST60 navigation,Raymarine RL70C Radar, Raymarine 12" color plotter. 3 Deep cycle marine batteries,30amp battery charger, 5.5kw generator,battery parallel switch.